Heal trauma. Reclaim your body. Live with wholeness. These are the gifts of utilizing the power of fundamental consciousness - a subtle field of awareness that lies within each of us. In Trauma and the Unbound Body, Dr. Judith Blackstone explores how we can resolve the mental, physical, and emotional struggles of trauma by connecting to our true essence, which can never be wounded or harmed. Dr. Blackstone is best known as the creator of The Realization Process, a powerful approach to healing and awakening based on deep contact with the internal space of one's body. 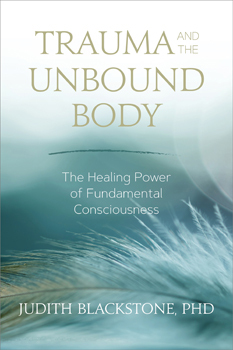 In this book, she shows us how trauma of the past may haunt our present life by getting unconsciously bound within the fascia (connective tissue) of the body, causing physical and emotional pain. Dr. Blackstone guides us through step-by-step processes to unwind those constrictions by connecting to a transcendent field, setting the body free of trauma once and for all and creating an unbreakable, unified ground of being.